It gets earlier and earlier each year, and now it looks like Black Friday has kicked off on November 9, with electronics retailer AO.com unveiling its first wave of deals. 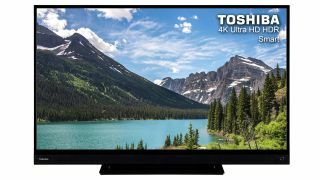 The initial batch of discounts weren't great to be honest, but things are now improving as you'll see in our guide to the best Cyber Monday 4K TV deals. If you dig in there are some bargains to be found, and we know that there are more to come over the course of December. AO isn't famous for Cyber Monday game deals, and it's worth noting that these are UK only at the moment, but we have found a good deal on a 4K TV that will work for anyone looking on a budget. In fact, finding a 43 inch 4K set for less than £300 is quite extraordinary. So, is this TV actually any good? Well, it's a 43 inch panel, which is good for a smaller living room or a bedroom. The 4K picture itself and HDR won't be the same quality as the very best gaming TV sets, but it's still a decent picture and it has HDR 10, which is the latest version of HDR. That's pretty important. It has a Game Mode, which optimises the picture and response rate of the screen for gaming, and it has enough HDMI slots to accommodate all three consoles (there are 3x HDMIs and 2x USB slots). It comes with Freeview built in, so you're all set up for watching TV through the aerial. Basically, it's a decent TV, and represents incredible value for £279. For a 43 inch 4K TV that really is a good price. If you're not sold on this, then wait around to see what the Black Friday 4K TV deals look like in a week or so. If you're looking for a cheap 4K TV, though, you won't do better than this. Elsewhere on AO.com, the site is offering an Xbox One X with Sea of Thieves for £489 (saving you £10), which is a bit guff. You'll be able to do way better than this throughout November, so steer clear for now. There's a bundle with an Xbox One X, Forza Horizon 4, Forza 7, Black Ops 4 and an extra controller for £539, which is a LOAD of cash for a console, but it's a fairly good deal all considered. Our advice is to wait for better deals unless you really want all those games. In which case, go for it. Stay tuned to GamesRadar for all your Black Friday shopping. And if you're in the market for an Xbox One X deal or you're looking for the best Xbox One bundle for you, we've got you covered too.